“In the last 20 minutes we were flat, we did not have the rhythm we needed. Winning that way, we suffered a lot in the first half, especially in the last 20 minutes. That is why I am delighted to win in that way. “It was a good win. After the Champions League it is always tough. People think it’s easy for us but that is not the truth, so I like to win in this way. “We were flat but after we were more aggressive and we changed the game. I asked them for more at half-time but the first five minutes was no good, they didn’t listen. 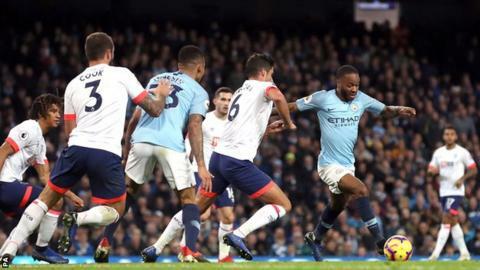 But one action from Raheem Sterling changed the game. “We nullified them for long periods and had moments ourselves when the ball could have bounced our way. It was a good time to score, right on half-time. “We haven’t done enough defensively and weren’t clinical enough in attack. We have an honest group of players and I can’t fault them at all. “The three goals we conceded were scrappy – they didn’t cut through us with beautiful football and we kick ourselves for that.